“The I.D. R Pikes Peak is the sporty forerunner of Volkswagen’s I.D. family. Today, we saw what this technology is capable of”, said Dr. Frank Welsch, Member of the Board of Management of the Volkswagen Passenger Cars brand with responsibility for “Technical Development”. “Every Volkswagen employee can be extremely proud of today’s result. I congratulate the team from the bottom of my heart. With a combination of outstanding engineering skills, passion and commitment, the team has managed to create a fantastic racing car in just eight months. The Volkswagen I.D. R Pikes Peak has now set the fastest time in the history of this hill climb, which spans more than 100 years – that speaks volumes for electric mobility.”19.99 kilometres, 156 corners, just one attempt – and a successful one: Romain Dumas claimed his fourth overall victory at the iconic Pikes Peak International Hill Climb, which has now been held 96 times since 1916. With the I.D. R Pikes Peak, Volkswagen has created an extraordinary racing car, specifically tailored to the demands of the most famous of hill climbs: a combination of minimum weight, as much downforce as possible, and maximum power, designed to achieve the best possible performance. Including its battery cells, the I.D. R Pikes Peak weighs less than 1,100 kilograms. 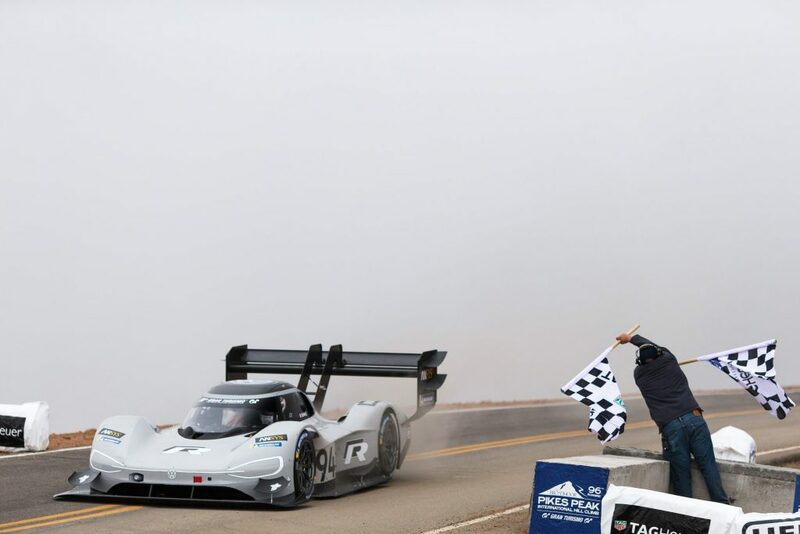 When evaluating performance, Volkswagen employed simulation software to calculate exactly how to achieve the optimum in energy demand and performance for the record attempt on Pikes Peak. In the matter of aerodynamics, the key was to compensate for the loss of downforce caused by the thin air on Pikes Peak. The result of this endeavour could be seen from afar: the flat, streamlined chassis and huge rear wing.Volkswagen also struck out in a new direction when it came to charging technology – the goal being to charge the car as quickly as possible with minimum environmental impact. The time was defined by the regulations: In case of the race being suspended, it must be possible to completely charge the car in under 20 minutes. The electricity required was provided by generators at the foot of Pikes Peak. Glycerol, which in chemical terms is a sugar alcohol, was selected as the fuel. A by-product of the manufacture of biodiesel, for example, Glycerol combusts with virtually no harmful exhaust fumes or residues. Glycerol itself is non-toxic and is even permitted as an additive in the food and cosmetics industries.A mere 250 days passed between the announcement and the start of the Pikes Peak project on 18 October 2017 and the record-breaking run on Pikes Peak on 24 June 2018. This was an extremely sporty remit for the development of a thoroughbred prototype, including innovative fully-electric drive technology, specific demands on the batteries, aerodynamics and chassis. This effort and the tireless work of the Volkswagen mechanics, engineers and many more employees in Wolfsburg, at the motorsport headquarters in Hannover and, last but not least, during the weeks of preparation in Colorado Springs, has now been rewarded with a new record on Pikes Peak.Volkswagen has had some strong partners on its side for the record attempt on Pikes Peak, in the form of Volkswagen R, ANSYS, Michelin, Integral e-drive and OMP. With Volkswagen R, the I.D. R Pikes Peak received a sporting seal of approval from the outset, which it more than earned on its record-breaking run, if not before. ANSYS also made a vital contribution to the success of the project by providing support with the software simulations. Another key factor was tyre maker Michelin’s years of experience on Pikes Peak, which allowed them to provide tyre technology perfectly tailored to the demands of the hill climb. The I.D. R Pikes Peak’s E-engines, which together generated 500 kW (680 PS), were achieved in collaboration with partner Integral e-drive. OMP put the icing on the cake – for example, with the featherweight racing overall for Romain Dumas, which perfectly complemented the lightweight design philosophy of the I.D. R Pikes Peak.